Distribution of the OB-type stars in He I (4471 Å) vs. Hγ (4340 Å) plane (filled circles). The colorful stars indicate the median positions of the spectral subtypes coded with colors for the luminosity class V stars. 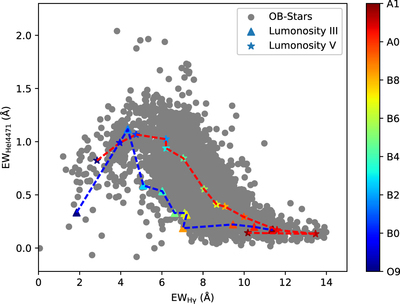 The triangles indicate the locus of the luminosity class III stars with the color-coded spectral subtypes.